2012 HE reforms reduce deficit but increase debt! The primary objective of the Coalition Government has been to tackle the UK budget deficit and reduce the national debt. Deficit reduction was a main justification for the Coalition’s reforms to higher education funding, which have shifted funding from teaching grants to tuition fees financed by government loans. Indeed, the reforms have achieved their goal in lowering the deficit, but have simultaneously ballooned the national debt. One could, therefore, question whether these reforms have achieved their goal. How can the reforms have both reduced the deficit and simultaneously increased the debt? In simple terms, the government reduced the deficit by dramatically reducing teaching grants. These were replaced by increased tuition fee loans which, due to accounting rules, have a smaller impact on the deficit than they do on the national debt figures. On paper, the HE funding reform has led to a modest reduction in the government’s budget deficit. But, since the object of deficit reduction is to relieve pressure on government borrowing, the fact that government is now borrowing more to finance larger, more volatile student loans, means that the gains from a reduction in the deficit are rather pointless. What matters in this argument is the relationship between deficit reduction and the national debt. The difference between deficit and debt is often confused, most notably by the politicians who preach about their importance. The “deficit” (known officially as the Public Sector Net Cash Requirement – PSNCR) is the difference between public sector revenue and public sector expenditure; therefore, it represents the amount the government needs to borrow to maintain its spending commitments. In contrast, “debt” (officially called Public Sector Net Debt – PSND) is the total amount of outstanding debt borrowed by government. When government state the importance of deficit reduction, it is because of the pressure the deficit puts on government borrowing. A larger budget deficit will generate a greater need to borrow to maintain current spending. Hence, one of the key arguments for reducing HE funding through grants was that it lowered direct public expenditure. Indeed, the dismissal of a graduate tax by Browne and by the Coalition was similarly based on the idea that it would put pressure on the deficit in the short to medium term. However, cutting the deficit does not automatically lower public debt. In fact, reforms which concentrate solely on deficit reduction can lead to an increase in net public debt. That may be acceptable in the short term, but when this debt lingers around, it basically defeats the object of deficit reduction, which is precisely the case in the reforms to HE funding. By replacing a portion of grant funding with higher tuition fees, financed through student loans, the government was able to reduce the deficit by way of an accounting trick, as Andrew McGettigan has explained. 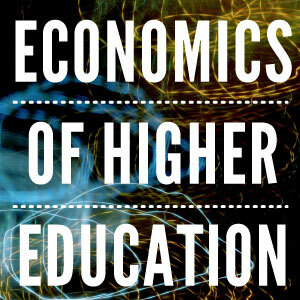 While grants are simply government expenditure, much of the expenditure on student loans (i.e. the cost of borrowing) is offset by the value of the loan repayments (i.e. 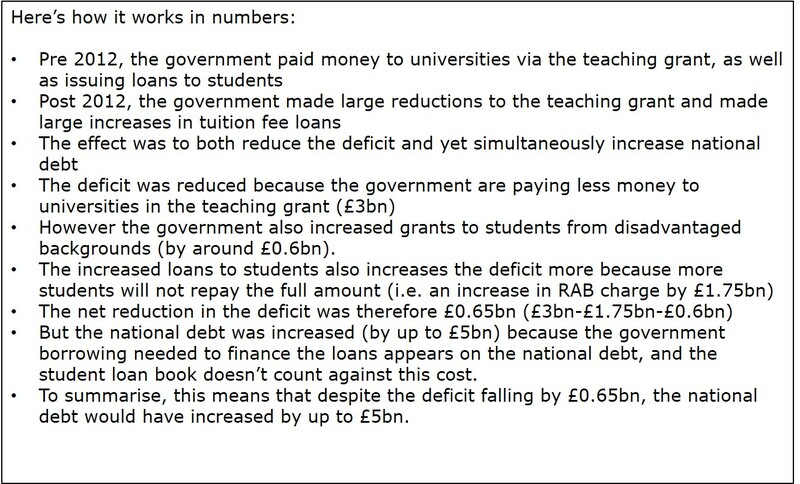 the student loan book), meaning that it appears to cut government expenditure, and therefore the deficit. Only the part of the loans that is written off (the RAB charge) will count as expenditure. The RAB charge appears on the BIS budget as a non-cash ‘impairment’, which means that it counts against the deficit, but doesn’t hinder BIS’ annual spending. The issue here is that, while the move from grant to loans looks good on paper in terms of deficit reduction, the increased borrowing doesn’t simply disappear. The government has to issue gilts to pay for the expansion of student loans, which appears in the national debt figure. Due to the way the national debt is accounted for, the Student Loan Book cannot be subtracted from it as an asset, because it is considered an ‘illiquid asset’. This means that the full cost of borrowing to pay for student loans is counted in the national debt figures. Based on current estimates, the increase in national debt directly attributable to the government’s funding reforms will be between £50bn and £100bn by the time the outstanding loan debt reaches its £200bn peak around the year 2040. Government now faces a mounting debt fuelled by larger student loans and lower repayments. They plan to lower this debt by selling off a portion of the pre-Browne student loan book. However, the level of up-front cash generated from the sale will offset only a fraction of the annual expenditure on the larger, more volatile post-Browne loans. Put simply, the sell-off will only marginally retard the increase in national debt caused by the government’s shift from grants to loans. The question on my mind is simple: If cutting teaching grants and hiking up tuition fees were justified on the basis of lowering the budget deficit, presumably to ease the national debt, is this approach not completely defunct now that it has proven to considerably increase the national debt? I would say the answer is an overwhelming yes. The selling of the loan book is an attempt to patch up the mounting failure of the reforms. But what we need is a new model, one with less narrow aims. One measure of the deficit would be Public Sector Borrowing Requirement – not PSNCR which is a cashflow rather than an income-expenditure measure. The RAB charge for the loss on the loans issued does n o t score in the deficit, which is why it is normally absent from Treasury ‘scorecards’. You are right that a sale would reduce PSND, but for that reason it has always been part of the government’s plans. A sale of the post-2012 coalition loans was outlined in the 2011 white paper – the real issue is why they have had to retreat from that and pursue a retrospective sale of pre-2012 ICR loans. One measure of the deficit would be Public Sector Borrowing Requirement – as well as PSNCR, which is a cashflow rather than an income-expenditure measure. There are clearly issues relating to the long-term sustainability of the student funding system in England which will need to be dealt with, but one point is worth clarifying: the RAB charge does not count against the deficit, as the author states – this is partly the point of the reforms. While arcane, this is significant, since it influences the range of policy options available to address specific problems in future, within the context of the Government’s overall economic policy framework. Yes apologies for the mistake in accounting for the RAB charge. There has been some confusion around this, and I think I picked this point up from the “False Accounting” report in 2012. Having read over the clarification on RAB charge given to the Public Accounts Committee, I can now see that the RAB does not count towards the deficit. Thanks to Andrew and Paul for pointing this out. That said, the argument against the current policies remains. Government were keen on reform, because it had a net impact of reducing the deficit, but it has led to larger borrowing to finance student loans. And Andrew is right to point out that the rush to sell pre-Browne loans has come as a result of this increase in national debt. Thus, even a larger reduction in the deficit on the books is rather redundant if it has been created by largely increasing the debt on student loans, and indeed the government’s attempts at bringing this debt down in the short term from a ICR loan firesale have the potential for long term losses future income.